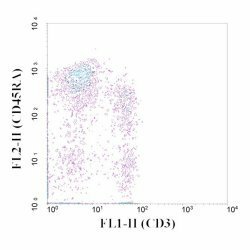 <Mouse anti Rat CD3:FITC/CD45RA:RPE is a dual colour reagent recognising rat CD3 and CD45RA cell surface antigens. Clone IF4 recognises rat CD3, a cell surface antigen expressed by mature lymphocytes. Clone OX-33 recognises rat CD45RA, a cell surface antigen expressed by B-lymphocytes. Use 10ul of the suggested working dilution to label 106 cell in 100ul. Tanaka, T. et al. (1989) Characterization of a CD3-like rat T cell surface antigen recognized by a monoclonal antibody. J Immunol. 142 (8): 2791-5.